Sorry, May 2019 workshops are fully booked. Additional workshops later in the year will be announced via our newsletter. Please sign up. We are running a number of one day truffle dog training workshops around the country. These fun and informative days are aimed at beginners with no previous scent-work experience. The focus of the day will be field-based exercises for you and your dog using truffle scent. There are no pre-requisites for dogs or handlers, attending this workshop. 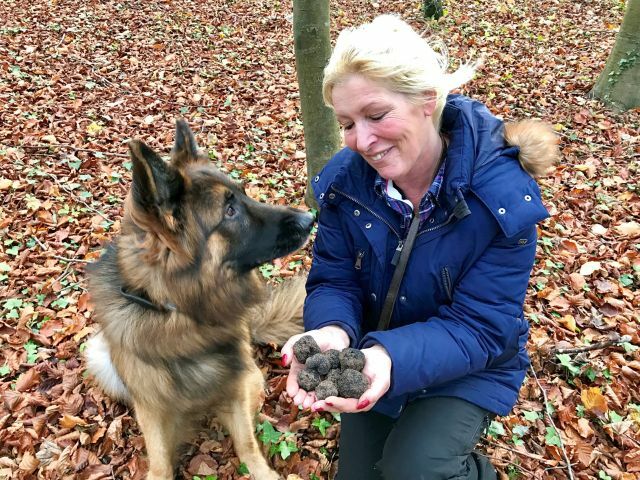 So attendees can carry on the training in their local environment, handlers will receive a truffle dog training kit, a bottle of truffle oil and extensive notes after the workshop. Theoretical presentations including scent work and finding truffles. 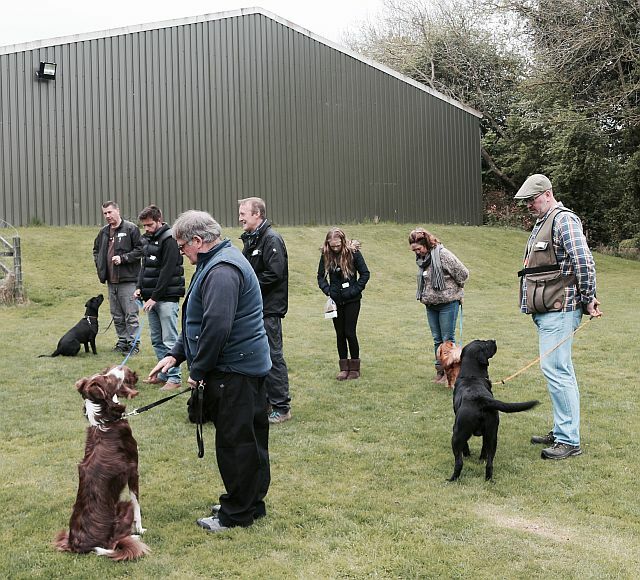 Practical sessions where participants start training their dogs to find truffle scent based on our explanations and methods. Workshops run from 10:00 AM to around 4:30 PM. 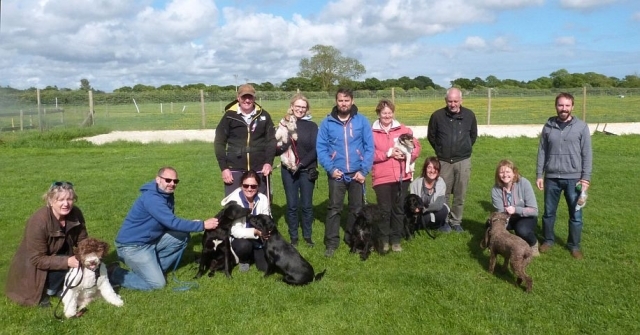 Places are limited to 8 dogs plus handlers. Additional family members can attend as spectators but a charge is made. Spectating may not suit children, please see relevant points in our workshop terms and conditions. 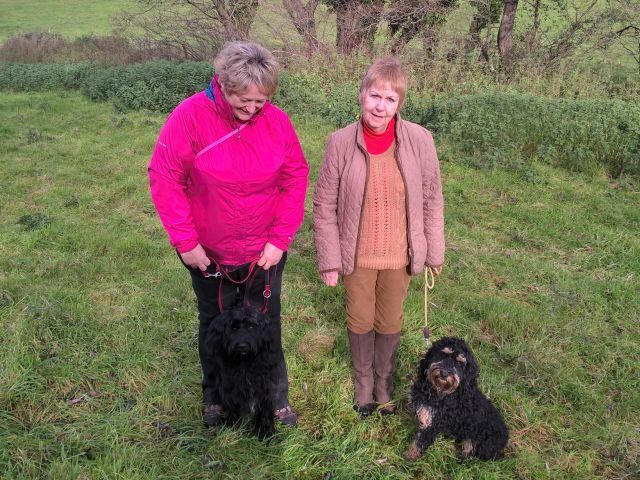 Sorry, but you cannot spectate unless you are accompanying a dog plus handler. Refreshments (tea / coffee etc.) will be provided but you will need to bring your own lunch or go to a nearby shop / café. 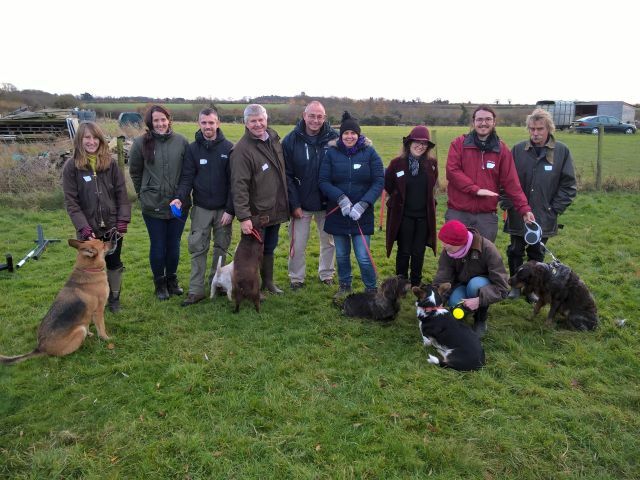 I am really pleased I went, it was full of valuable information and practical help from someone who deeply understands dogs and truffles and crucially how to explain how to make the combination live for beginners, (dogs and humans). Anon. Thank you so much! We had such a great time, and I don’t think I’ve enjoyed researching a UK story so much. Thanks for being patient and fun, and a great teacher. I can’t wait to write it. Hannah Summers, Young Travel Writer of the Year 2015 – having a lesson for a forthcoming national newspaper feature. 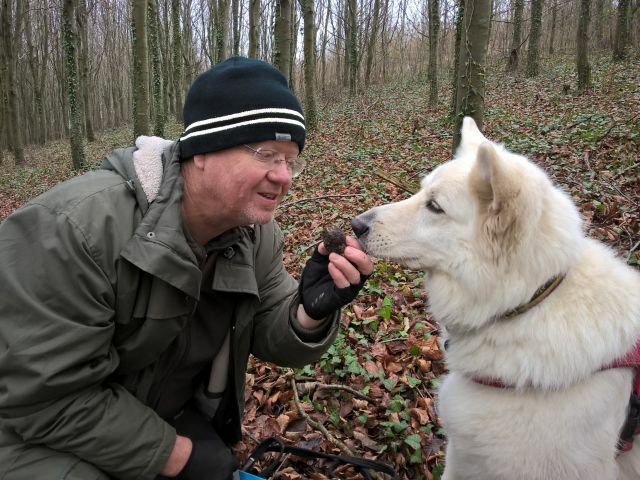 My German Shepherd dog Malik and I have had the pleasure to be trained in truffle hunting by James. 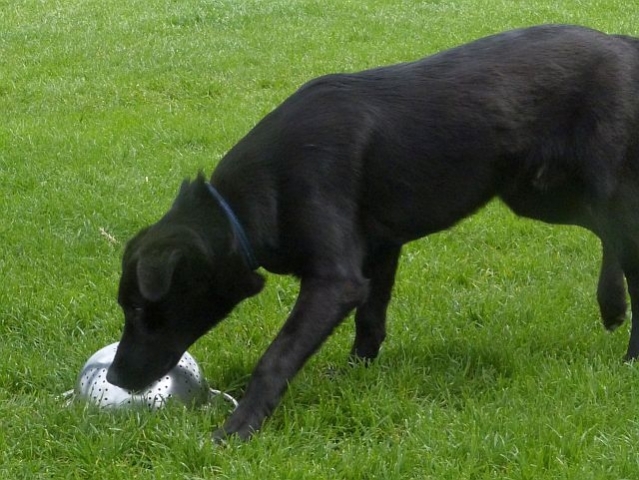 The gentle but thorough, force-free method used leads to an exceptionally accelerated understanding by the dog. 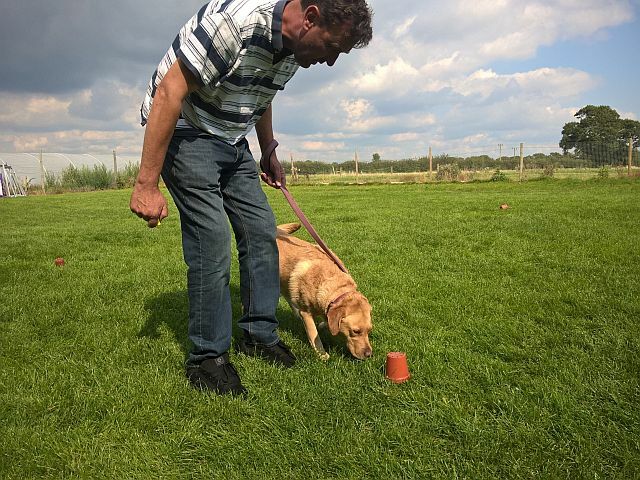 It’s a truly joyful learning experience for both handler and canine companion. I can’t wait for the Autumn to put all our training into practice. KD, Hampshire. 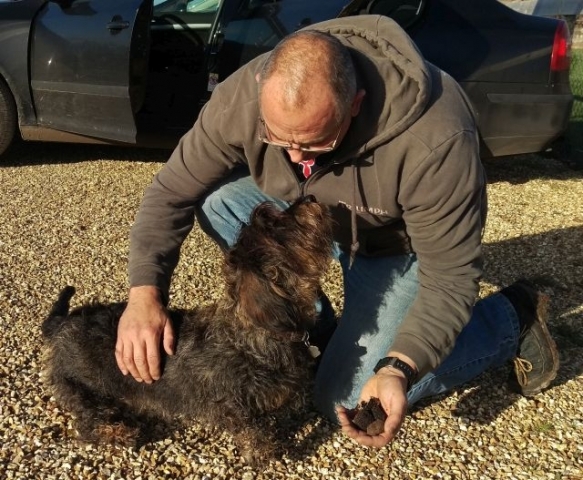 I tagged along with a friend to one of the English Truffle Company’s training sessions not really thinking my Jack Russell would ever learn to be a truffle hound but James’ step by step method of training proved me wrong. 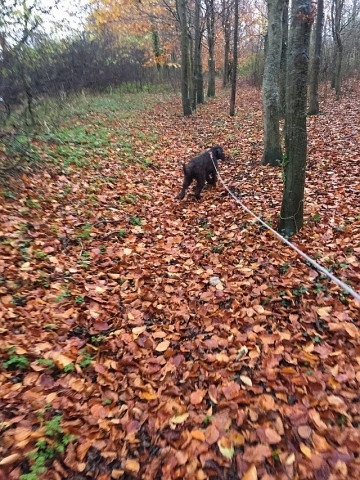 The dog quickly learnt to identify truffle scent and went on to recover a hidden lure [frozen truffle] without difficulty. Obviously the dog will need more training but I’m pretty confident I’ll be selling truffles on line later this year… SB, Wiltshire. 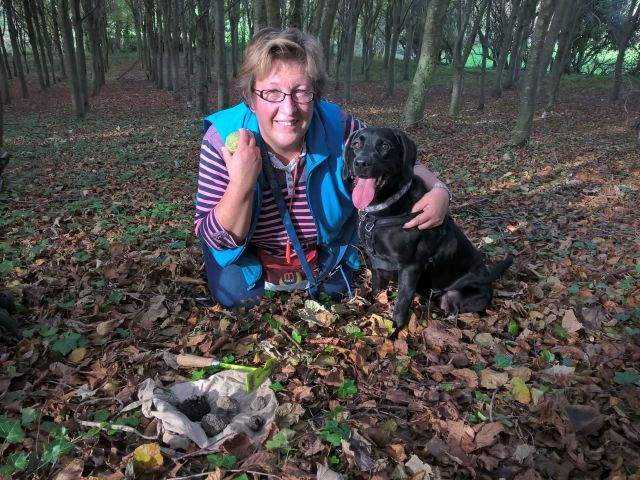 Through trying different strategies in a fun way, James was able to help Pippa form associations with the truffle scent and a treat – so really pleased we went home having achieved more than I had hoped in just one training session. MP, Dorset. People make different choices. You get notes after your lessons including the exercises covered so can go away and do lots of homework. Some people do one lesson then carry on their own. 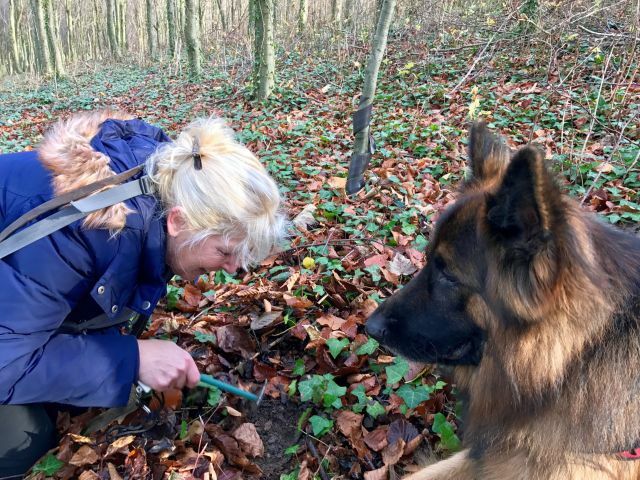 Some do one lesson a month starting with field-based ones outside of the truffle season before moving on to woodland ones just before and in the season. 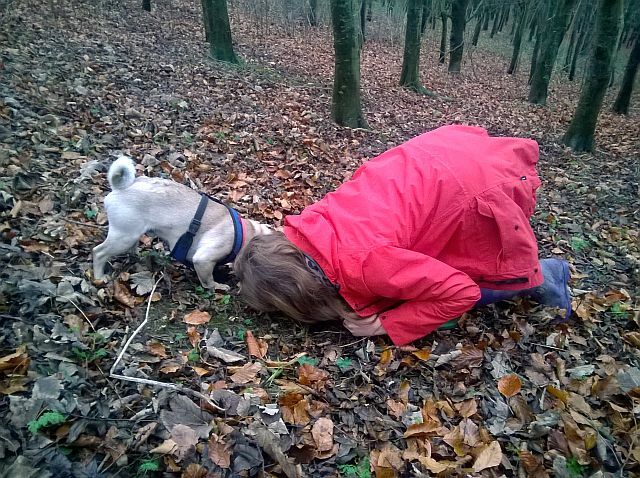 Some dogs get the basic idea in one lesson, others take longer. One lesson won’t make them “masters” of truffle hunting though, it takes time and experience. 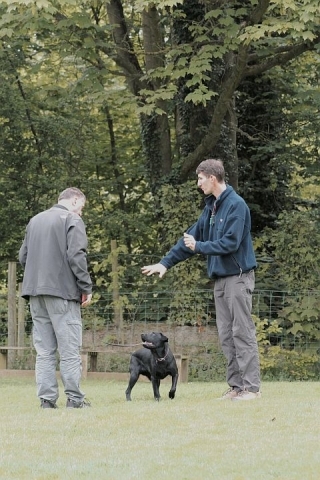 There are more advanced topics that can be taught once the basics are understood – directing the dog, indication, etc. The human needs as much, or more training than the dog! 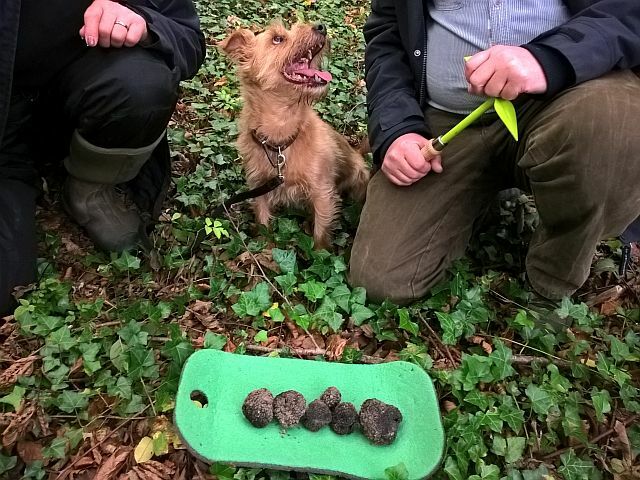 Our truffle hunting experience days offer a great start for humans. Can an older dog be taught to find truffles? Yes, contrary to the old saying you can “teach an old dog new tricks”. 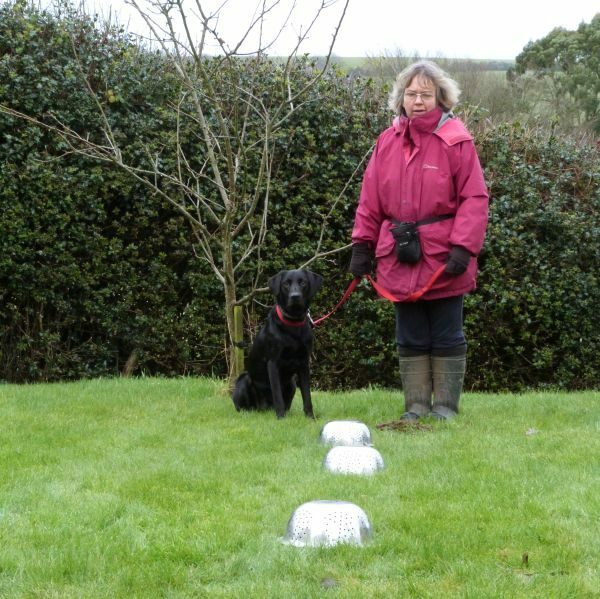 Our own dogs have learnt to find truffles at 6, 6 and 4. Dogs on our woodland lessons that have found truffles have all been adults. 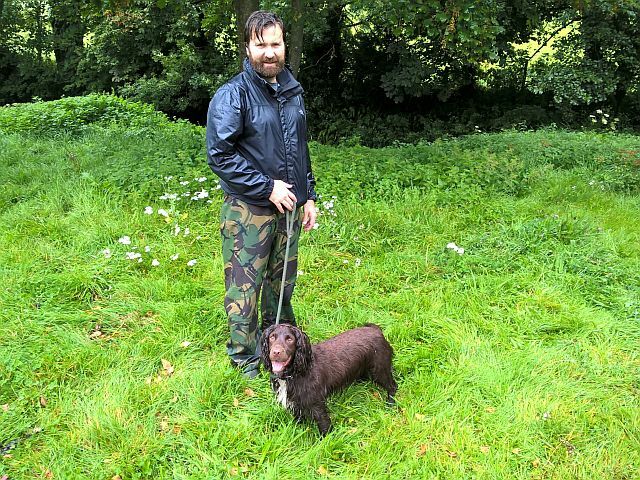 What age should I start truffle dog training for a puppy? A key consideration is not over-exercising a growing puppy. This risks overtiring it and damaging developing joints which might lead to arthritis. 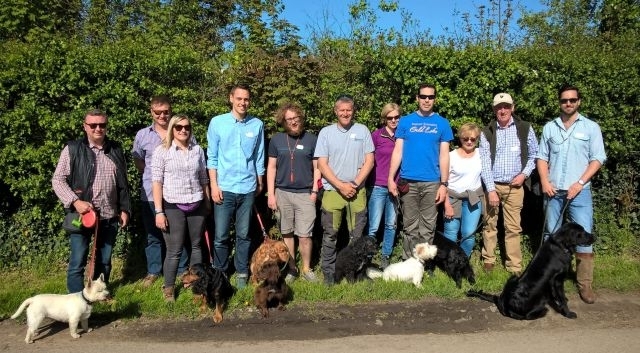 A rule of thumb from the Kennel Club is that puppies need five minutes of exercise per month of age up to twice a day, In other words, a 3-month-old puppy will need 15 minutes of exercise while a 4-month-old will need 20 minutes etc. At 3-4 months, as well as teaching obedience (especially recall!) 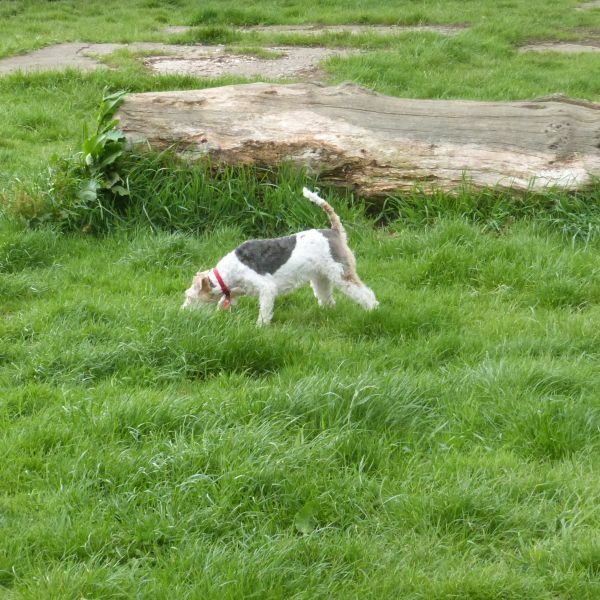 you can introduce scent games such as hide and seek for their favourite treat. 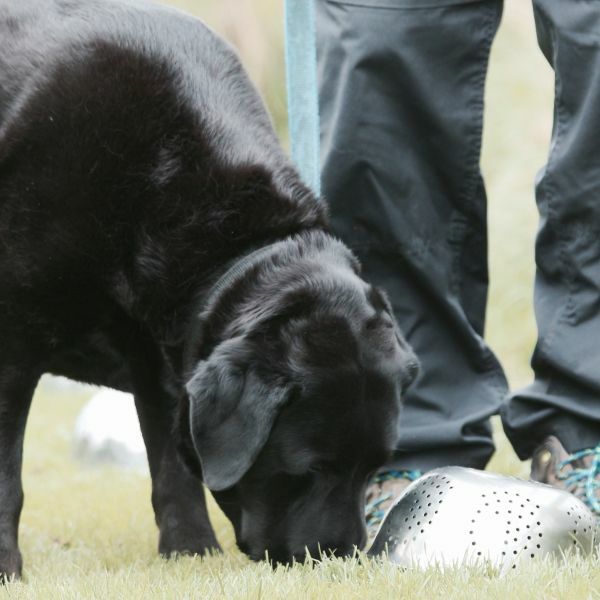 As dogs are naturally inclined to use their noses and are often motivated by food at an early age, it is an ideal time to make a start. 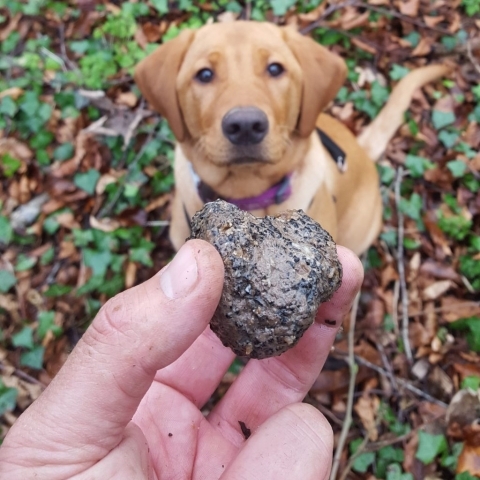 Age, however is not what determines if they are ready for truffle training; they need to be motivated by food or toys, be keen to please and be able to concentrate for brief periods. Is there a good time of the year for training? 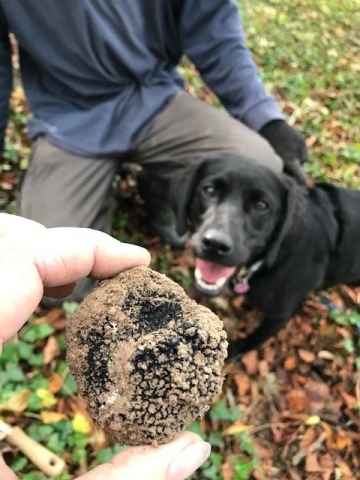 Our main period for finding truffles is September – the end of January. Training can however, happen at any time of year. For lessons, we use truffle oil and fresh or frozen truffle (depending on if they are in season / we have any). We can run lessons at any time of year, but would try to avoid extremes of weather (cold, warmth etc.). 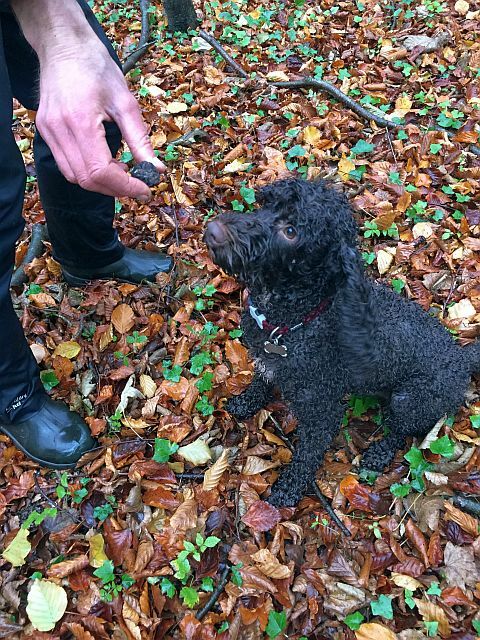 Woodland lessons can include your dog searching for naturally growing truffles. 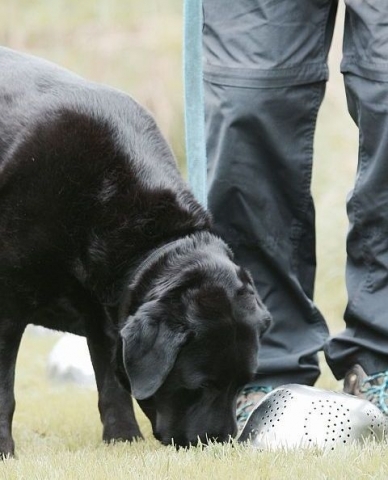 Which breeds of dog are best for truffle hunting? 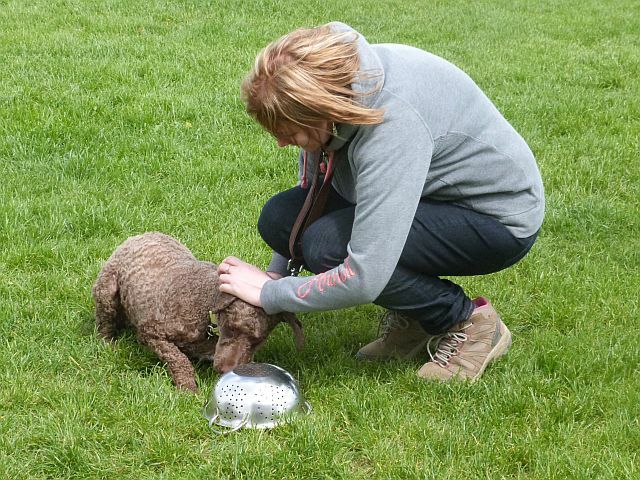 The Italian breed Lagotto romagnolo is the only breed history defined as a truffle hunter. They resemble a cross between a poodle and a terrier. 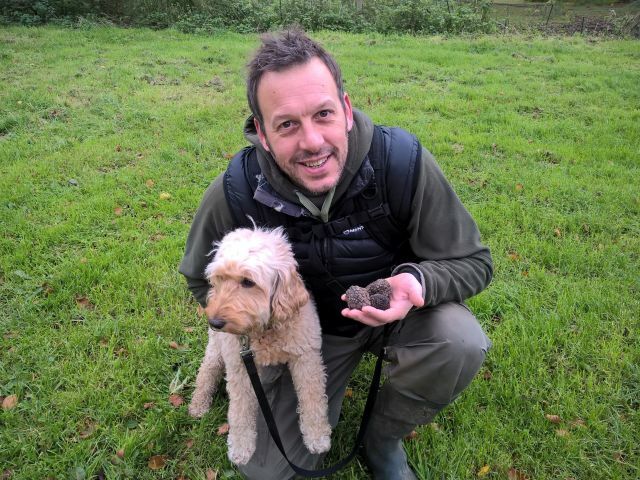 Poodles are also associated with truffle hunting. However, it is more about the attitude of the individual dog than it’s breed. They should be motivated by food or toys, have a desire to please and be very keen to use their nose. 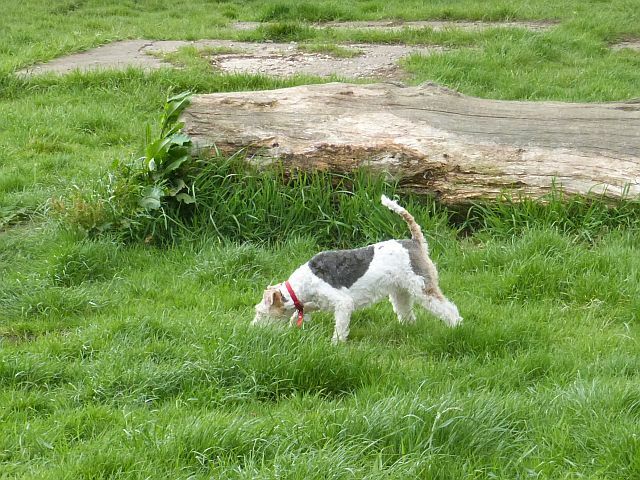 They should not be too distracted by visual stimuli or other animals such as squirrels and game. 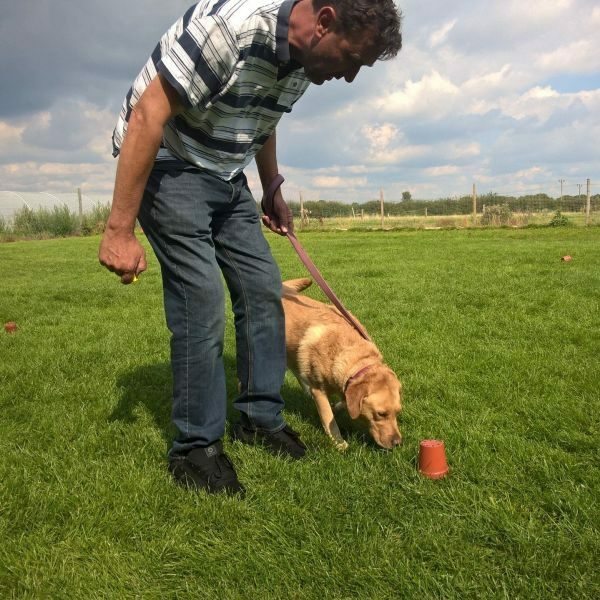 We have trained many breeds from Jack Russells and Terriers to German Shepherds and many more.